Between the Columbia River Gorge and the high desert of Central Oregon lies an undiscovered country. Sunny and tranquil, the highways wind through a string of small towns where friendly residents have been quietly making their living in farming, ranching and outdoor recreation for generations. Towns like Wasco, Moro and Maupin aren’t exactly secret, just far less traveled than others — and somehow more attractive for it. Wheat fields, windmills and waterfalls abound on this scenic drive in Deschutes River country. Exit Interstate 84 just east of The Dalles near Celilo Park, future home of a Maya Lin installation as part of the Confluence Project. Here US-30 passes the Deschutes River State Recreation Area, where you’ll see anglers casting from the bridge and wading in the sparkling waters at the river’s mouth. Narrow OR-206 leads up Fulton Canyon into a rolling sea of wheat, blue skies and country roads, where passing farm trucks offer a two-fingered salute. 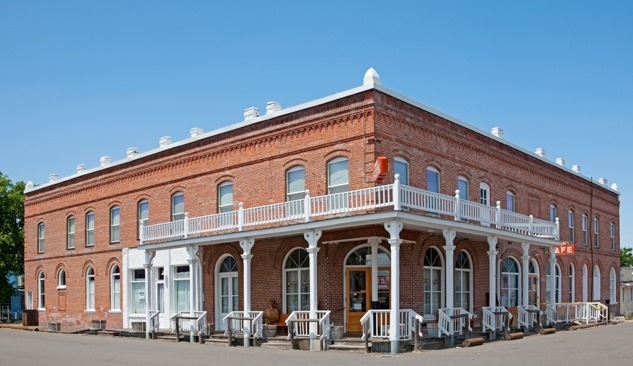 Founded in 1898 near the Oregon Trail by wheat farmers, the town of Wasco (pop. 410) is now part of the growing wind-energy market, evident from the large turbines along the ridgeline. A drive into town reveals a collection of houses and weathered buildings, the most distinctive of which is a grand, centenarian schoolhouse that now serves as the town library. The Columbia Southern Railroad Depot houses the Wasco Railroad and City History Center, open Friday and Saturday and by appointment. Stop in at the Lean-To Cafe and Goose Pit Saloon — serving up burgers and steaks for more than 30 years — or The Feed Trough food cart for breakfast burritos, biscuits and gravy and sandwiches. Nearby Cottonwood Canyon State Park has access to fishing, boating and camping on the John Day River. As you head south to Moro on US-97, look for beautifully weathered buildings from the past like the Locust Grove Church and the Fairview Pioneer Schoolhouse. From Moro, two routes beckon. Driving farther south on US-97 provides a side trip through Shaniko, one of the region’s most popular ghost towns (with a handful of living residents and thriving businesses). A shorter route follows OR-216 past family farms and down twisting, white-knuckled curves to Sherar’s Bridge over the Deschutes River. (Avoid this route in the wintertime and check driving conditions along this route before you go.) Named for a 19th-century settler who operated a toll bridge here (as well as a hotel and stagecoach stop), Sherar’s Bridge is now a destination for white-water rafting, fly-fishing and camping. 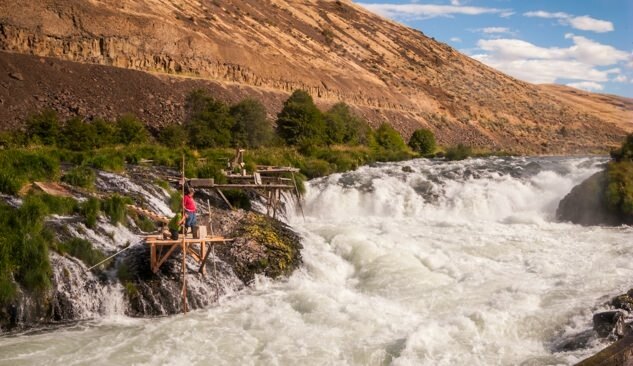 The paved BLM access road on the south side of the bridge follows the Deschutes River as it carves its way through the basalt canyon, offering breathtaking views of rapids, riffles and brilliant 15-foot Sherar’s Falls, a historic fishing site for the Western Sahaptin Indians. The waterfall is now on the Warm Springs Indian Reservation and remains a tribal fishing site. The town of Maupin (pop. 418) is signaled by a towering grain elevator. Named for a 19th-century pioneer who also ran a ferry here, Maupin’s history has long been tied to the river. Today you can enjoy the river in myriad ways: Book a rafting or fly-fishing trip, or just enjoy the rich animal and bird life with a hike along the river. The quiet back roads around Maupin also make for great bicycling. Stop for a bite to eat at the riverside lodge of the Imperial River Company, serving beef and lamb from their own nearby ranch. Tuck into a savory breakfast at Oasis Café also known for its burgers, ribs and creamy milkshakes. Grab a cold beer at the Rainbow Tavern, a local institution. From Maupin, US-197 will take you north to The Dalles (with the option for a quick side trip to White River Falls State Park, just 4 miles off the highway), or farther south toward Madras. Whichever way you choose to go, adventure awaits out in Deschutes River country.